Bastardization, abomination or bang on point? they know exactly how to illicit a response whether it be positive or negative. A prime example is their Rolex Submariner Royal Blue Lefty down the bottom of the post which I actually kinda' dig. 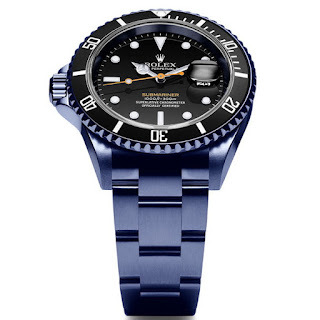 Back to the Rough Matt Diver with its provocative style that will likely induce some kind of the aneurysm among the purists of you and leave even the most chilled of us choking on our morning char. There will be one or two of you reaching for the Kleenex, too, but before you do, you better make sure you’re sitting comfortably to hear its full price of 18260€ which excludes VAT but does include shipping! I think the current price for a new Sub no date is just shy of 7000€, so what are you getting for your 11260 euros? The Rough Matt Diver has been modded in 4 specific areas: finish, bezel, dial and rotor. FINISH Using an exclusive in-house dual-tone polishing technique, the bracelet, the top and the bottom of the case have been sandblasted while each side is mirror finished. It took 126 hours and more than 14 skilled craftsmen to complete the finishing – really?! BEZEL Artisans of Geneva developed a Sea Blue color, with orange indexes made by hand and filled with a needle. DIAL The dial was vertically brushed before plating in blue PVD. Each point is framed in orange. It took 7 different crafts to achieve. ROTOR Finally the Rolex caliber is given an exclusive signature, 21ct massive gold rotor, made by hand. It is decorated with Geneva Stripes and has circular polishing. Thoughts? 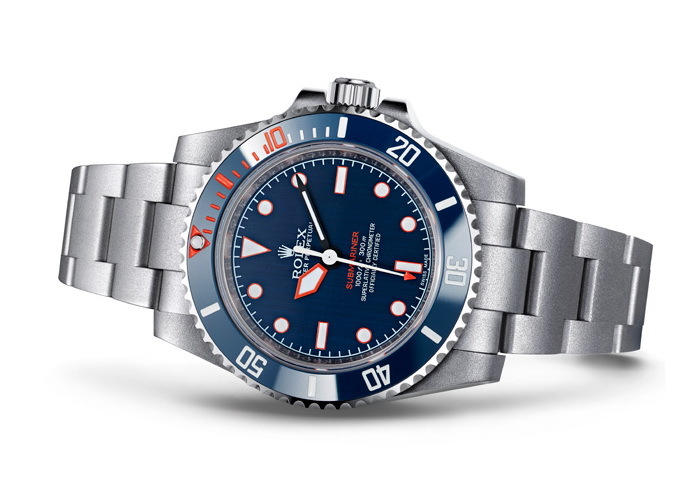 It’s kind of odd seeing a broad sword on a Rolex as they’re mostly associated with SM300 but Rolex have used them in past such as on the Subs created for the British Royal Navy in the 70s. However in this instance it’s as an orange hour hand, therefore becoming the more prominent of the two hands which is wrong. So too is the lack of lume on the sweep seconds indicator.